Those look adorable! We skipped the white chocolate. Your buttons are gorgeous! I love the sprinkles on top. I liked these too! How cute with the sprinkles! I haven't made these yet due to work/back issues and am kind of on the fence (for me to be on the fence with anything chocolate, the world must be grinding to a halt!) Your tips are great and I'll keep them in mind when I do make these. Oooh, how adorable! I like how you exercised restraint with the sprinkles... so precious. OK, waaaay too cute !!! Excellent advice. I didn't use nearly good enough chocolate and it was noticeable. I used Bakers Joy to spray my pan with, and it worked out perfectly. I frosted mine with orange cream cheese frosting. These are adorable. The sprinkles are a nice, festive touch! Great looking bb you have! Your brownie buttons look adorable! We loved them too; my only regret was not doubling (or tripling!) the recipe! I like the sprinkles, we liked the buttons too. These are so cute. The sprinkles are perfect for a party! Your buttons look awesome!! I absolutely loved these!! What a prefect little treat! They look delicious and adorable. Cute buttons. I'm glad you liked them. those look great. Your frosting worked out much bettr than mine. Great suggestions at the end. I couldn't agree more. I love the idea for freezing them (that is, if there are any leftover). Your buttons are too cute! They look great. These weren't my favorite, BUT, I just tasted another one, two days old and really liked it this time--by it, I mean the orange flavor. Really good. Love the sprinkles on your brownie buttons. These are super little snacks- no guilt 'cause they are so small. Problem is- I will eat more than one! 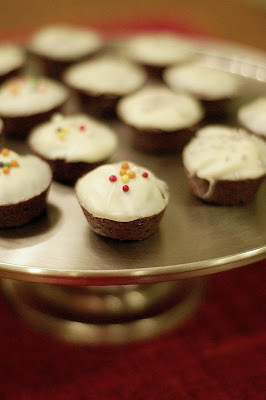 Your brownie buttons look soo sweet with the sprinkles on top! I love that you left an adoring comment on Dorie's blog! I often felt like doing the same!